Made with 1,000 pounds of butter! 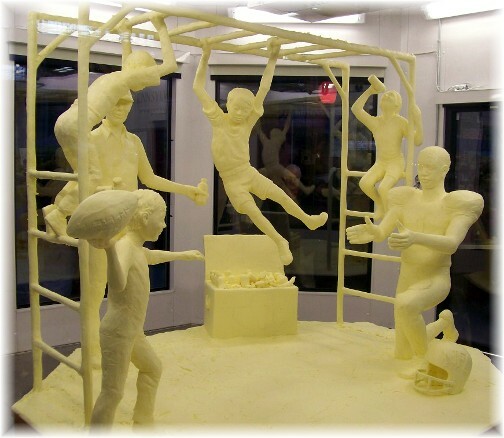 Pretty amazing to consider that the boy hanging on the playset is made of butter! Yesterday I went to the Pennsylvania Farm Show. In the course of walking through a huge exhibit area I came to a display booth for "The Fellowship Of Christian Farmers". Realizing that giving a public witness for Christ can be discouraging I engaged in a brief conversation with the two men staffing the booth. I thanked them for their labors for the Lord and their efforts in sharing the gospel at the Farm Show. In the course of our conversation one of them pointed out that as Christians we are all farmers in the sense we are all to be sowing seed. Now that's an interesting perspective and is true even of the city folk reading our message today. We are all (if we are obedient) sowing seed, watering, providing nourishment and reaping. There are quite a number of Scriptures that use the agricultural analogy in regard to the spiritual life and ministry. Jesus told His disciples to "look on the fields, that they are white for harvest" (John 4:35). In several of His parables He used agriculture as an illustration; I suppose most notably in the parable of the sower. The teaching epistles also use these types of illustrations. In our daily text Paul is describing the establishment of the church in Corinth. As the founding Pastor he had planted the seed in this church. Apollos had followed him in ministry and had watered the seed. Paul made it clear that both had an equally vital role. But God made the seed grow. The principle is the same in individual lives. In some we sow seeds, in others we feed, water and nourish the germinating seed. Our goal is an abundant harvest. But ultimately God makes the seed grow. Keep farming out there! It may be years (or even into eternity) before you hear from that germinating seed or that soul for which you faithfully watered and provided nourishment, but we have a commission and a promise. Let us stay faithful! Daily Prayer: Father, we want to be faithful in sowing seed so that we will reap an abundant harvest of souls snatched from the eternal fires of hell. We desire to show mercy to unbelievers, all the while, hating even the clothing stained by corrupted flesh. Help us to be salt, light, and hope in this darkened world, we pray. Amen. He told the following story from a perspective I feel we all need to hear more often. This is particularly true for those of us who live in lands of relative peace and great prosperity. There was a church leader who had a simple farm near others. Each year her crops flourished and others, wanting to know her secret, asked, "What kind of manure are you using?" In seeking to give the glory to God for the blessing (but in a way unseemly to us) she replied, "God is my manure!" This interesting note from a friend in Texas in response to yesterday's message on "Spiritual Dialysis": I just wanted to say thanks for today’s message on “Spiritual Dialysis.” I appreciate your ministry and look forward to your teaching every day. The Lord always speaks to me through it. But today’s message especially struck a cord in me. I had a kidney transplant almost eight years ago and was on dialysis before that. I have always thanked God for all of this, but your message today allowed God to teach me yet something more through this experience. You are so right about how much dialysis and confession relate to each other. A transplant is more like placing our faith in Christ. We have a new kidney that now allows us to be closer to God’s original intent. When my wife first saw me after my transplant she said I looked like a new person. It brings to mind 2 Corinthians 5:17: “Therefore if anyone is in Christ, he is a new creature; the old things passed away; behold, new things have come.” I know every analogy breaks down at some points, but thank you for helping to view my dialysis and transplant with more spiritual eyes. It has given me still more to praise our Lord for and to share with others who are going through these things as well. 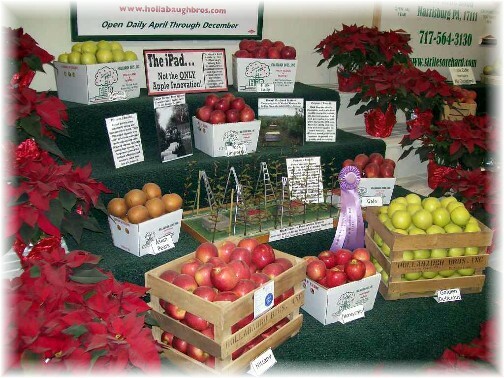 At this display we enjoyed a variety of freshly cut up apple slices. Lots of tractors, old and new! 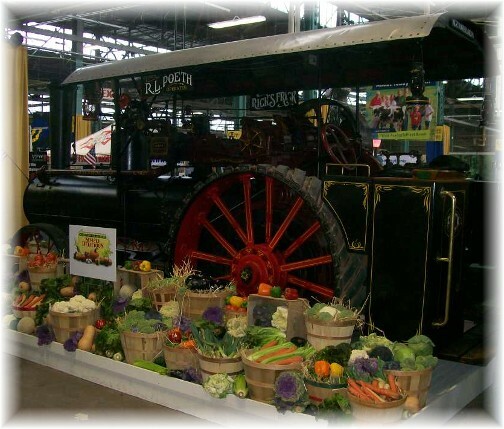 This giant old steam tractor was surrounded by produce bounty. The children sure enjoyed all the sights, sounds and smells of the farm show. 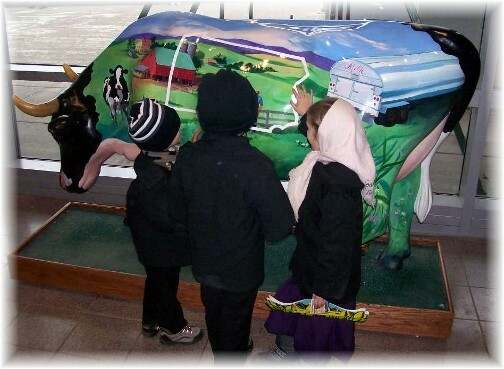 Since they are raised on a dairy farm and are around cows all the time that's sure no big deal but they thought this painted cow was pretty neat! "Bringing In The Sheaves" Video Chuck Wagon Gang Note: Sheaves are the large bundles in which cereal plants are bound after reaping. Earlier hymn writers often drew from both the Scriptures and their own experiences in conveying truth. Take notice of these excellent lyrics in light of our message today. 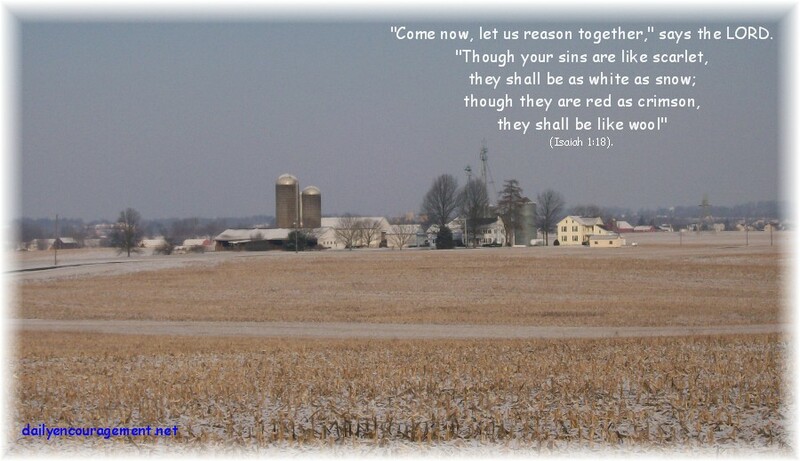 A joyful recollection is when we haul our Amish friends around and the children sing this song! 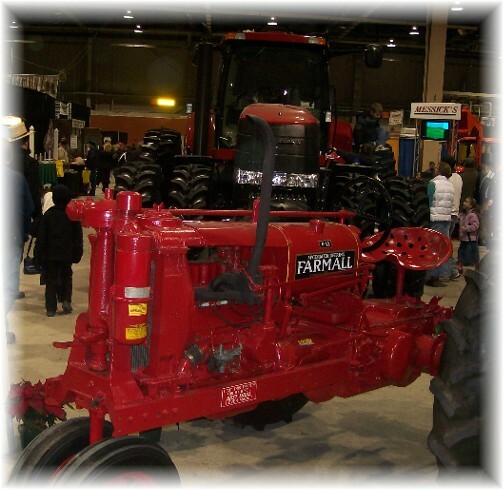 The Pennsylvania Farm Show is a huge indoor agricultural show with many interesting exhibits large and small. 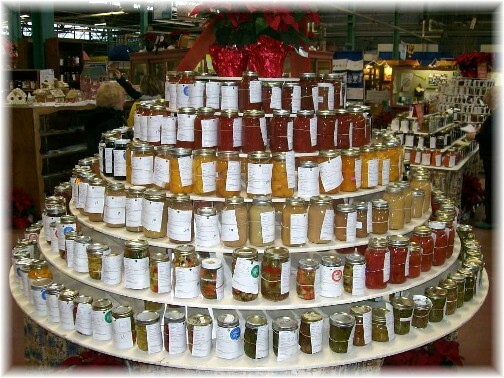 It's similar to a summer state fair but here in Pennsylvania they hold it in the winter. Yesterday on the way home we drove through a snow storm and have a beautiful snow cover this morning.